Protective Day Cream is a intensive natural formula with deep protective and moisturizing effect for healthier, radiant skin. The regular use of Protective Day Cream protects the skin from the influence of the environmental unfavorable factors – sun, wind, cold weather. It helps moisturizing and rejuvenating the skin; restores skin flexibility and elasticity; rebuilds the skin’s micro-relief network. Coconut oil – protects the skin against sun damage, improves the moisture and lipid content of the skin, delays the aging process, repairs skin and gives it a healthy glow. 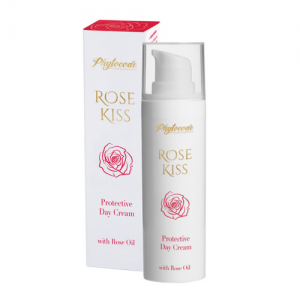 Bulgarian Rose oil -helps balance moisture levels in the skin and reduces the appearance of skin imperfections. Wheat proteins– nourish and smooth the skin, improve skin’s softness, decrease number and depth of wrinkles. Beeswax – soothes and protects the skin from drying without inhibiting its ability to breathe. Directions for use: Apply each morning with light massage motions on well cleansed face. Gets absorbed quickly.